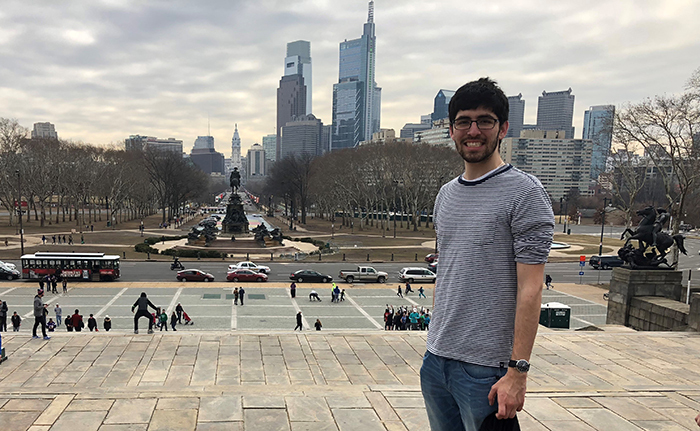 “One makes family and friends wherever they are,” says Liam Stenson Ortiz ’19, and that has certainly been true of his time at Dickinson College. Whether getting involved as a tour guide or RA, through student-leadership programs, as a class officer, or through service trips, language tables or The Trout Gallery, he’s found a diverse and welcoming community. He’s also committed to helping to make the world a better place, and he’s preparing for a career in international medicine. Biochemistry & molecular biology, with a health studies certificate. MANdatory (student leader), Dickinson Science Magazine, Student Senate (first-year class president), service trips (student leader), Pre-Health Society (treasurer), language tables (Spanish, French and Portuguese), Trout Gallery language assistant, Residence Life & Housing (RA), and Liberty Cap Society (tour guides). Perseverancia Scholarship, internship grant and RMHC/HACER scholarship. Relato de un Náufrago by Gabriel García Márquez. I chose Dickinson because when I visited, I realized that this place attracts a certain type of student: passionate, sustainable (in knowledge, in environmental concerns and global engagement) and ready to share with the community in many ways. Additionally, there are amazing science departments with really great professors. I could learn, get involved, give back to the community and not worry about if I could afford my education. Pesto sandwich from the Quarry. I came in thinking I wanted to do biomedical engineering. Then I realized I was more interested in the patient interaction than research. I chose biochemistry & molecular biology because I am passionate about the natural sciences and I want to prepare myself as much as possible for medical school, and this path would allow me to do so while still challenging me in the aspects of science in which I am not the strongest. … an archeologist. That was before I knew that paleontologists are the actual people who study dinosaurs. I like listening to music in pretty much any language (even the ones I don’t understand until I look up the lyrics). Global Health with [Adjunct Faculty in Health Studies] Margaret Winchester. This has been by far my favorite class at Dickinson, because Professor Winchester has had amazing experiences working with HIV/AIDS in South Africa that she tied into the classwork. She is so passionate about how anthropology and medicine relate to access to health care in many different settings. This course did not only challenge me; it also made me think about medicine in a whole different way. Gabriel García Márquez, so I could talk to him about his experiences in Colombia during the period of La Violencia, and about his relationship with Fidel Castro. [Associate Professor of Spanish] Hector Reyes-Zaga. We are from the same city, so he understands my language, culture and family structure. I admire his character, and the way he pushes me to become the best I can be and to analyze everything, rather than just looking at it through my idealistic view. I realize that I would not be here if it weren't for many people who have helped me along the way. I believe that one chooses their family, and that families are not necessarily families because of blood. I will never be able to repay them. However, I can always pay it forward. I am most proud of helping people and of doing my best to learn about everything, because all knowledge is valuable in some way. I did not study abroad, but I took part in a service trip to Belize over spring break. I loved learning about the language, the culture and the ways we could help. We helped refurbish the gardens of two different schools, and we taught the kids about sustainability, played with them and bonded as a team. This was one of my most valuable experiences at Dickinson, and it is so hard to express and understand the experience unless you live it yourself. Dickinson has opened my eyes to people from all over the world and perspectives I had never thought of before. Since I got here, I have made close friends from China, Rwanda, Italy, France, Spain, Russia, Argentina, Ecuador, Vietnam, Czech Republic, Dominican Republic, Pakistan, Cameroon, Nepal, Bangladesh, Belize, El Salvador, diverse places in the U.S. and even my home country—only to name a few. Each perspective has been invaluable to me, and I have Dickinson to thank for my excellent global education. … everyone would help (at least) one other person not related to themselves, regardless of their race/ethnicity/culture/gender/sexuality/religion. We would help them succeed in whatever they need to fulfill their potential in our global society. I stayed at Dickinson this summer, so I could work as a summer tour guide and also volunteer at UPMC Pinnacle Carlisle Hospital. This was a great opportunity to give back to the Carlisle community, since I will be graduating this upcoming year. This fall I'm conducting research with [Associate] Professor [of Chemistry] Rebecca Connor on heat shock protein 70. I plan to take a year or two off after college to study for the MCAT, work at a lab or hospital, and then study medicine. Eventually, after all my studies, I want to use my language skills in English, Spanish, French and Portuguese to practice medicine internationally in organizations such as Médecins Sans Frontières (MSF) and Partners in Health (PIH). Dickinson was a chance for me to find myself within an intellectual and service-oriented community, give back to it, and continue my journey to learn and accomplish my goals as a global citizen in the medical field. One makes family and friends wherever they are.